You can't turn a corner at IFA 2018 in Berlin without stumbling across a pair of true-wireless earbuds, the sort that comprise two individual pieces, connected only by the magical power of Bluetooth, one for each of your ears. JBL is doubling down on the format this year with two new models: the JBL Endurance Peak and the JBL Free. First up, the JBL Endurance Peak, pictured at the top. They're aimed at sporty types, and are well suited to swimmers with their IPX7 waterproof rating. Designed to comfortably fit most ear types without falling out, they feature "PowerHook" technology that allows them to intelligently turn on or off when you put them on or take them out. Complete with a charging case that offers a speed charge mode that gets you an hour's worth of playback from ten minutes charge time, you get 28 hours of battery life overall, with 4 stored in the earbuds themselves and 24 in the portable case. They'll go on sale in November for £129.99 (roughly $170, or AU$230). The JBL Free are up next, and are more focussed on pleasing commuters. They're again truly wireless, with a charging case that can provide 24 hours of playback when combined with the buds themselves. Though they're not as rugged, but they're splashproof too thanks to an IPX5 rating. 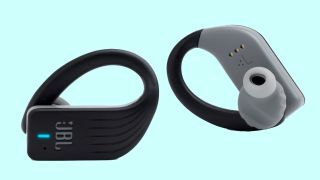 Both the JBL Free and JBL Endurance Peak offer hands-free calling with an integrated mic, though the more discreet oval design of the JBL Free might make them better suited to everyday use. Available in black or white, the set is available now, priced £119.99 (around $155, AU$210). IFA 2018 is Europe's biggest tech show. The TechRadar team is in Berlin to bring you all the breaking news and hands-on first impressions of new phones, watches and other tech as they're announced.